The new Rover 800 Series form and function, power and refinement, luxury and quality in unique harmony. The Rover marque means more than a tradition of engineering excellence unique in the motor industry. The Rover philosophy embodies a total commitment to meeting, and surpassing, the requirements of our customers. Our customers’ needs, extensively researched, have been the driving force behind the evolution of Rovers new flagship. In the new Rover 800 Series. discerning drivers will discover a car created with one simple aim – to provide completely new standards of satisfaction. The following pages offer you an insight into the many benefits which make the new Rover 800 Series a luxury executive car of the very highest order. A car where every detail has been carefully designed, from the robust yet elegant lines, to the finely crafted interior. A car which inspires pride of ownership, with the excellence of its build quality. A car which is rewarding to drive, yet designed to help care for the world about us – coupling smooth, responsive power with advanced environmental engineering and high levels of safety. The real proof, however, will emerge when you take your place in the driver’s seat. You know, better than anyone else, the qualities you seek in the car you choose to drive. We are confident that you will find all of them, and more, when you drive the new Rover 800 Series. A major design feature contributing to this effortless control is the expert layout of the driver’s cockpit. Take your place at the wheel, and you discover an environment so perfectly designed that driving is like second nature. The rake-adjustable steering wheel, combined with height and lumbar support adjustment for the driver’s seat, allows you to select the ideal driving position. The gear lever falls naturally to hand, with light movements and a well-defined gate allowing fast, smooth gear-changing. (A choice of manual or automatic transmissions is available on the majority of models.) The foot pedals all give the same light but positive action, whilst the driver’s left footrest enhances cruising comfort. The simple logic of the controls makes them quick and easy to use, with all major switch functions within finger-tip reach on the two column stalks. The instruments, with speedometer and tachometer on two classically-shaped dials, are clearly readable, minimising distraction from the road. The overall ambience is of a car which is sheer exhilaration to drive. 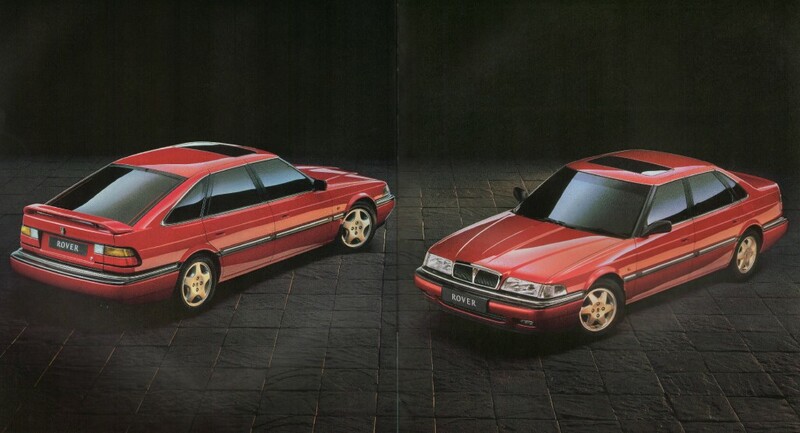 From the first glance, the form of the new Rover 800 Series reveals the major themes underlying its design. Perfected by the classic Rover grille, the shape is strong, purposeful and distinctive, creating an immediate impression of power and prestige. Intelligent design has made best use of the car’s impressive proportions, providing a spacious, comfortable passenger cabin, with legroom well distributed between front and rear. The sleek lines are not only beautiful, but also aerodynamically efficient. Air flows with minimal turbulence around and over the car, aided by the front spoiler and rounded panel design. Many other features further increase aerodynamic efficiency, including flush glazing, and meticulous attention to the design of headlamps, door mirrors and the smoothness of the underside of the car. The result is an excellent drag coefficient of only 0.51 which, combined with the rigid body structure and quiet engines, gives unruffled cruising refinement, as well as good fuel efficiency. On closer inspection. you discover the most important hallmark of all. The immaculate fit and finish of panels; the minute attention to detail; the deep lustre of the paint finish – all testify to the technology and commitment to quality which have created the new Rover 800 Series.